WARNING: This tour will not be for the faint of heart. The Dirty Ol’ One Man Band Scott H. Biram is gearing up to go screaming and howling all across the United States in 2019, and he’s dragging a cadre of cool performers along with him that should get dark roots and underground country fans salivating. After playing some solo shows this January and February in the South, Biram will be hooking up with the wild mayhem that is The Goddamn Gallows, and the the string band virtuosity that is the Urban Pioneers for a 24-date package show. Scott Biram’s devilish mix of country, punk and blues brews well with the Gallows’ serrated sound and raucous shows. All three acts are survivors of the underground country scene, with Jared McGovern and Liz Sloan once comprising the backing band for Bob Wayne before becoming principle members of Jayke Orvis’s legendary Broken Band. Now Jayke is back playing mandolin with the Gallows, which means this tour ensemble could possibly give way to collaborations galore. 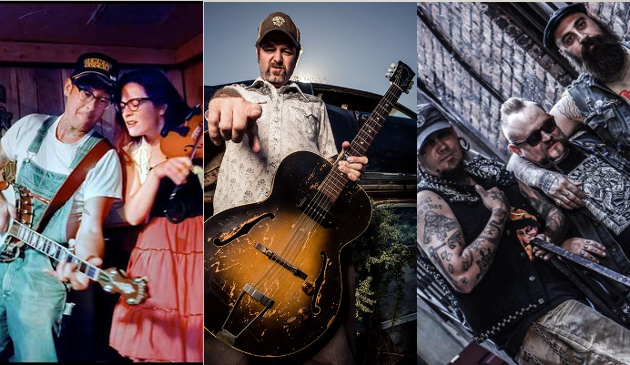 The Goddamn Gallows released their latest record The Trial in 2018, and the Urban Pioneers’ 2018 release Hillbilly Swing Music made Saving Country Music’s Essential Albums List. The string trio is said to be heading into the studio soon for a new record, and will be playing their own solo dates ahead of the Scott H. Biram / Gallows tour. Bring it to the Northwest! Hell, yeah! If I get kicked out of this show, something is wrong. Something unrelated..TRIGG,it was 25 yrs ago today the ‘Northridge’ earthquake hit. Causing all those LA musicians to move to Nashville. Then,causing Alan Jackson to write/ sing “ Gone Country”. I just got the announcement Mike and the Moonpies are coming end of March! I never excepted them to tour this far north! Nice. Just saw that, too. And Whitey Morgan March 21st (same day as Whiskey Myers). You made that comment about Pittsburgh and my phone won’t stop going off about concert announcements! I’m kinda irritated I’m going to miss Biram at the White Water. I was down there over the holidays. Biram’s like a dirty old jar full of fireflies. All boy. Doc Watson fan. Heart of gold. Damn it, no CO. It’s been a while since I’ve seen a line up that I would be excited for. Even though I’ve seen Biram multiple times, the Gallows more times than I can remember, I’ve never had the opportunity to see the Urban Pioneers outside of the short lived Broken Band. Hopefully they add some locations. Travis, we are talking about bringing this tour package to Colorado and the rest of the West. We will also be working to bring both The Goddamn Gallows and Urban Pioneers back to Colorado at some point soon. And Scott Biram’s agent is will be doing the same for him. Hope this comes out west, Biram and the Gallows are both must see’s live. TV’s Avery is never coming back. He lives in France now.